What an absolutely incredible couple of weeks it's been since the launch of my debut book The New Fashion Rules on the 1st November. Thank you for making my first foray into writing a book such a wonderful, joyous experience and allowing me to celebrate alongside all of you on social and in person too. From seeing people receive their pre orders, to hand signing hundreds of copies and from meeting new friends during book events, to throwing the most epic launch party surrounded by my work besties. It's quite simply been the most memorable of launches and I don't think it has quite sunk in yet that my book is finally out in the big wide world. Eek! From the bottom of my heart, a huge thank you to every single person that has supported me. To everyone who has created a #frowflatlay, has taken the time to congratulate me and has left a glowing review over on Amazon - you have truly blown me away with your kindness and I will be forever grateful for what an inexplicably beautiful experience this has been. First of all a huge thank you to Glamour who very kindly threw me a launch party to celebrate the release of The New Fashion Rules. The room was filled with so many people I have worked with over the years including some of my favourite brands and friends. Not only that, the always delicious Borough 22 created vegan doughnuts inspired by the cover of the book and we drank pink gin as we celebrated my milestone! Oh and incase you were wondering my dress was by the beautiful Twinset Milano and you can shop it here. Secondly a massive thank you to the guys at the Central Library in Manchester for allowing me to hold my book event in their beautiful building, in a city that holds a massive piece of my heart. I couldn't not hold an event back up North and it was the perfect venue for it! Between the inspiring conversation and being able to chat with so many like minded people over a glass of bubbles, it was such a perfect, relaxed evening. Thirdly the biggest thank you to the staff at Selfridges in London who allowed me to host my London book event with them where I had the opportunity to meet so many new friends and even a few old faces too. I came away with the biggest smile on my face and rather kindly some beautiful presents too - a real dream of an event in an ideal central location. And last but not least thank you to you for being a part of this journey with me. Even if you haven't managed to grab a copy of my book, your likes, comments and kind, supportive words mean the world to me and keep me feeling motivated and inspired to keep on creating. I can't wait to share my 2019 plans with you all! 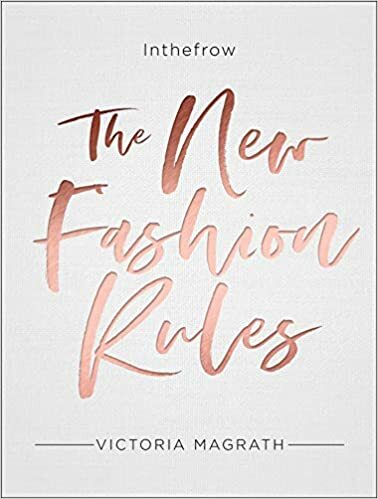 If you've been looking to pick up your own copy of The New Fashion Rules or if you're thinking about buying a copy as a Christmas gift for a friend (hint hint!) then these are just a few of the places you can find worldwide delivery and purchase a signed copy too! You will also be able to check Waterstones stock levels below as well as leave reviews over on Amazon once you've finished your copy too - yay! You can shop all of my outfits here.